The video assistant referee (VAR) will be implemented in the 19th Edition of the MIC – Mediterranean International Cup (from April 17 to 21 in the region of Girona) as a test for its implantation next season in LaLiga 1|2|3 (Second Division A). This arbitration assistance tool was released last summer at the Russian World Championship, organized by the Fédération Internationale of Football Association (FIFA), and this season is already being used in the UEFA Champions League, at the great European leagues, including LaLiga Santander (First Division) and the Copa del Rei. 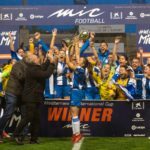 In December, the RFEF approved that the VAR would also extend to the second Spanish division in the 2019/20 course and the MICFootball tournaments will be part of its first tests in about twenty matches of the U-19 category (A1) that will be played at the municipal soccer field of Lloret de Mar, one of the 34 venues of the competition. The delegation of the Federació Catalana de Futbol in Girona has been the venue of the presentation of this agreement. It has counted with the participation of Xavier Moreno Delgado, vice president of the Comitè Tècnic d’Àrbitres of they Real Federación Española de Fútbol; Juanjo Rovira, director of MICFootball and Jaume Dulsat, mayor of Lloret de Mar. Moreno Delgado explained that «we have chosen MIC because it is a very important tournament, in Lloret de Mar we will have the test with live matches. In order to have the final authorization for the use of the VAR, which is given by FIFA and IFAB (International Football Association Board), a few hours of internship, simulators and matches must be followed online and offline. 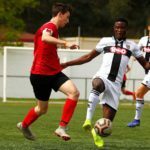 It will be a full week, the second division referees are just as professional as the ones of the first one, the tests and the concentrations are also demanding». Juanjo Rovira, on behalf of MICFootball, has showed himself «very pleased and appreciated that they have thought about our tournament for this test and VAR training. It is a satisfaction and a detail that gives us even more repercussions and prestige to the work that we have been doing for the last 19 years». The Mayor of Lloret de Mar, Jaume Dulsat, valued the presence of the VAR in the municipality as a «great news, we will make our field as if it was a Professional Soccer League and we are delighted. Lloret is the organisational epicentre of MICFootball, which is surely the most important football tournament in the world». The referee commitee (Comité Técnico de Árbitros), has been working a long time on this method with offline matches with LaLiga 1|2|3, with training courses headed by Carlos Clos Gómez, the Project Director in Spain, in the city of Las Rozas, in Madrid. During the base football tournament organized by MICSports, consisting of about eighty members (the 22 principal referees of the second division, their 44 assistants and responsibles of the technical area) will be concentrated in Lloret de Mar from the 15th of April to the 22, with the organization of MICFootball. The referee team will carry out an intensive week of training at the VAR –this will be the first hours of practice in live matches- consisting of field training, online and offline matches and simulators in two mobile units, rooms known as VOR that will be in the same field of Lloret de Mar and that they are habitual in matches of the UEFA Champions League. In the hotel where they will be staying there will also be a VAR simulation room as the one in Las Rozas and the Lloret football field will feature a minimum of eight cameras scattered around the pitch. This will be the first time that the referees of the second Spanish division will participate in a training football tournament and during the MIC – Mediterranean International Cup they will teach how does the VAR work to coaches and U-19 category players. During Easter, the MICFootball will arrive at the 19th Edition after the record of last year with more than 900 games played and 372 participating teams, from 42 countries on 5 continents. This time it will be held from April 17 to the 21st and will count with the parctipation of nine categories, from U-12 up to U-19, in male f-7 and f-11; and in U-19, in female f-11. At the same time, the other tournament organized by MICSports for Easter, the MICBasketball, will be holding the third Edition from April 18 to 21 and will feature matches of male and female categories, distributed between U-14, U-16 and U-18, with the will to overcome the presence of 112 teams from 11 countries in 2018.